Our two most luxurious treatments are paired together for a special price. The Warm Stone Massage and Wellness Signature Facial. The treatment begins with a Warm Stone Massage. Smooth, polished Basalt Lava Stones are warmed in water and applied to the body. The stones are then utilized with essential oils in a full body massage. Benefits come with deep heat therapy and relaxing massage. The warm stone massage eases tight muscles, relieves stress, and alleviates tension. The treatment continues with The Wellness Signature Facial. It includes your choice of aromatherapy steam, followed by a paraffin hand treatment. Designed to tone, hydrate, moisturize and rejuvenate, while providing the utmost in relaxation. With 26 minerals & trace elements, Dead Sea products are utilized by the world’s finest spas. Your retreat begins with a therapeutic massage and back scrub utilizing sea salts combined with seaweed & olive oil. Then you will experience a rejuvenating Dead Sea Mud Facial with refreshing, rich black Israeli mud that peels off to unmask a revitalized new you. Your retreat begins with a relaxing 45 minute massage, followed by either the Tropical Papaya or Cryogenic Facial. A great combination of treatments for just about anyone. New treatments for Holidaze will be coming soon. Perhaps it will include a “healthy glow,” an all natural vitamin infused serum, which will leave you looking radiant with a “sun kissed” for 2-3 days. 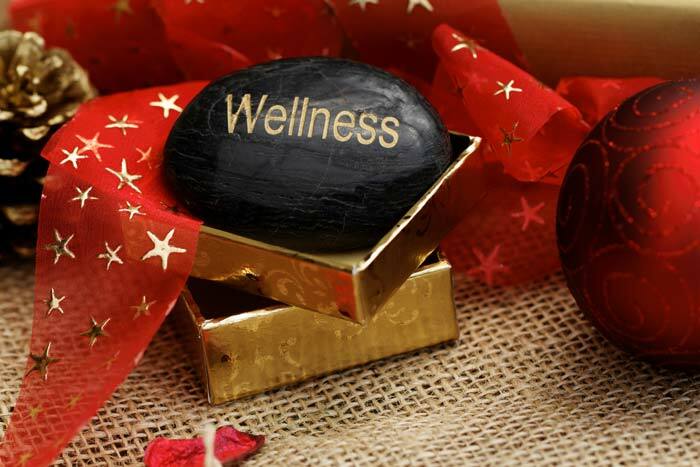 A perfect little Wellness Holiday! Get notified of our Special Promotions!